First Baptist Church of Port Neches had its beginning one hundred years ago, and during its history has known days of prosperity and adversity, times of great joy and sorrow. The vision of its people has seen it rejoice in strong faith and victory. Progress was slow during the next two or three years. The little church held meetings only occasionally and met with the Methodists in Sunday School. Bro. W. L. Robertson, J. E. Lutewilder and W. W. Young held brief pastorates. Much of the leadership during the early years of the church has been attributed to Mrs. J. E. Trussel. Bro. V. V. Youngblood was called about 1913 as part-time pastor. During this pastorate the first church building was erected, in 1914, on a lot given by Mrs. R. E. Rachford. In 1918, Bro. W. H. Fortney came to the church as the first fulltime pastor and served for 14 years until 1932. In 1926, the first church building was sold and moved and building was begun on a brick structure which was completed in 1927. The first trustees were: J. W. Baker, F. Marvin, W. D. Drawhorn, C. J. Gentry, Edgar White, and C. O. Stewart. Bro. Joe Bryant served as pastor for four years from 1932 to 1936. In 1935 a group of the members withdrew from First Baptist Church and organized the present Central Baptist Church. Bro. D. A. Youngblood was called to the church in 1936. During Bro. Youngblood’s pastorate the church burned on January 10, 1940, destroying most of its contents and with loss of all records. Bro. Youngblood was ill during the latter part of his pastorate and Bro. R. J. Brown served as supply pastor. During this time the church built a new building at Dearing and Avenue B to replace the burned structure. Bro. F. E. Swanner became pastor in 1942 and served for two years. He was followed by Rev. Lonnie Webb, who served the church until May 15, 1950. During Bro. Webb’s pastorate and under his leadership, the church secured, in 1946, with a vision for the future, the property on the Pure Atlantic Road (now known as Magnolia Avenue) where the present church building is now located for a cost of $3,400. Bro. S. M. Mulkey was called as pastor in August 1950, and served until October 14, 1951. Bro. Frank Oglesbee served as supply pastor until the church called Bro. J. C. Clement on December 12, 1951. In 1952 Mr. Maurice E. Walmer of Beaumont completed the plans for the present edifice and construction began in 1954. Many hours of labor were donated by members of the church and the cost of construction was financed by special offerings, love gifts, and the selling of Broadway Bonds. During this time, the church experienced a period of great growth. Under the leadership of Bro. Clement there were two services held every Sunday morning until the new church building was completed. The first service in the beautiful new building located on Magnolia Avenue was held June 30, 1957 with a dinner on the grounds. Bro. Clement resigned from the pastorate in November of 1957 and Bro. W. A. Corkern of Beaumont served for three months as supply pastor until the church called Bro. James O. Morman on March 16, 1958. In June 1961 the First Baptist Church celebrated a Homecoming in observance of its fifty year anniversary with a full day of worship on Sunday and a week of services. The number of deacons in 1961 was 26. Upon Bro. Morman’s resignation on November 8, 1964 Charles W. Hawkes became interim pastor and served until October 1965. The church called Dr. Roy A. Lambert as its pastor in October 1965 and he served for five years. In order to reach the people in the Woodcrest Housing area a decision was made to establish a mission there, and on May 18, 1969 the first Sunday School and church services were held. Bro. T. J. Sasser was approved as the mission pastor on February 1, 1970, was licensed on May 6, 1970 and was ordained October 20, 1974. Dr. Lambert resigned July 31, 1970 to become the Director of Missions for the Golden Triangle Baptist Association. Bro. E. C. Andrews became interim pastor at this time and remained until February 1971 when Bro. Wilton Anthony became the pastor and served for twelve years. On November 10, 1971 the church having fulfilled its obligation on all church bonds, the trustees were instructed to burn Bond Series 1, 2, 3, & 4 (Retired). In 1972 plans were made to renovate the auditorium at a cost of $121,000 and work began April 10. Upon completion, the dedication was held on May 28 of that year. Planning began shortly thereafter for the building of an activities building and construction was started in July 1972. The building was completed in May 1973 at a cost of $185,470.11. In August 1978 the church assumed Trinity Chapel as a mission. In September 1978 Woodcrest Mission was closed because of the tearing down of the Woodcrest housing units and the mission was moved to incorporate with Trinity Mission as one mission of First Baptist Church. Bro. T. J. Sasser then became pastor of Trinity Mission where he served until January 1980. Dr. E. A. Autry became mission interim pastor and then full-time in April 1980. Dr. Autry resigned as Trinity Mission pastor in May 1983 and Bro. Carlton Evans was approved as pastor there in June 1983. The mission was closed in June 1984. On May 11, 1983 the Assembly of God property across from the church on Sixth Street was purchased for $145,000. Bro. Wilton Anthony resigned in June 1983. Bro. Charles Hawkes became the interim pastor at this time and served until March 1984. Dr. H. Gaylon Riddle was extended a call to become the church’s pastor, which he accepted in March 1984 and served until May 15, 1991. It was decided that the Sixth Street property (former Assembly of God buildings) should be made into a Day Care Child Development Center. After much alteration and repair, which was done by members volunteering their services, the center was opened on August 20, 1984. In the November of 1991, the First Baptist Church Family called Dr. David Mahfouz as pastor and he served until November 2015. In February of 1992, the Church Family approved the Miracle of Ministry Remodeling Campaign and extensive renovations were carried out on the church plant. The goal was to completely remodel all existing education space, the Sanctuary and Family Life Center. Church workdays involving our entire church family became a regular event for the next few years. In 1994 work started on the worship facility and the existing debt of the church was restructured. Douglas Young served as the Minister of Education, Bill Gravell Minister of Youth and Robert Smart was the Minister of Music. Expanding ministries demanded better transportation and in 1994 a new Thomas Bus was purchased by the church family and left the week after revival with a group of students for a trip to Colorado. A new Bluebird bus was added in 2004 with video system and a more comfortable ride and upon acquisition left for Branson with a group of Senior Saints. The extensive work on the building and properties included the purchase of additional properties on sixth street directly behind the Family Life Center in 1993. The remodeling of the Family Life Center with a new gym floor, a commercial kitchen and the building of additional educational space on the second floor extended into 1994 and early 1995. A place for you, radio broadcast featuring the morning worship services was started that same year. Recognition for evangelism and growth has been a part of the life of First Baptist Church of Port Neches. In 1994 recognition came for Innovation in Ministry and the church was featured at the Breaking Edge Conferences. Pastor Mahfouz was invited to speak at these conferences for the Baptist General Convention of Texas and at the Home Mission Board Evangelism Conference in Portland, Oregon. Event Evangelism has featured the Power Team with a Drug Prevention Program offered to the Port Neches-Groves I.S.D middle school students. Heaven’s Gates and Hell’s Flames was presented by a cast and crew of the church and through the two events over 900 professions of faith were recorded. In 1999 Dr. Mahfouz was invited to speak at the Texas Baptist Evangelism Conference and the church was recognized for its achievement in personal evangelism. A Sunday School High Attendance featuring Disciple Now for grades 6 through College and a Bible Study emphases recorded 978 in Attendance on a Sunday Morning for the Bible Study hour in 1994 and the church and event was featured in the Texas Leadership Magazine of the BGCT. In 2000 First Baptist Church hosted the Southeast Texas Regional Evangelism Conference in Partnership with the Baptist General Convention of Texas and registered over 1200 participants at the event. Cross-Over Port Neches efforts have involved the church in the distribution of Bibles into every home in Port Neches, the distribution of 10,000 Jesus films, and the presentation of 5000 Soul Winning New Testaments. Block parties, National Days of Prayer, Ministerial Alliances, Community Wide Thanksgiving Services have all figured prominently into the strategy to fulfill the Great Commission and the Great Commandment. Missions has figured prominently in the life and ministries of the church over the last 15 years. Adult Mission Trips to Mexico allowed the church family to partner with other Baptist churches in the construction of a Mission Church and then a medical building in the following year. Student Mission trips to Mississippi, the Rio Grande Valley and Spain have involved a number of young people in direct mission work. Adult Mission trips to Peru have featured medical services and the presentation of the Gospel. All of this has been accomplished to the Glory of God. The heart of the people of First Baptist Church Port Neches and their sacrificial giving has resulted in the church being recognized as a top giving church in the Southern Baptist Convention to the Lottie Moon Christmas Offering. In 2008 First Baptist Church planted a new mission church in Beaumont in cooperation with the Baptist General Convention of Texas and the Golden Triangle Baptist Association. The pastor of the mission church is Torey Doucette. 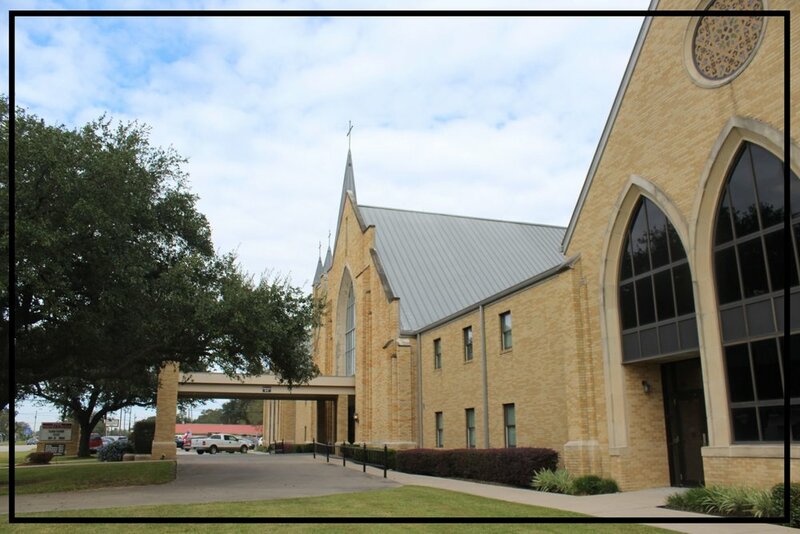 One of the unique relationships First Baptist Church Port Neches enjoys is with Community Prayer Care & Family Outreach. This ministry was established to meet the needs of the indigent of our community. This ministry is currently distributing 8000 pounds of food a month to the greater mid-county area. In 1999 the church family contracted with Architects Rabe and Partners to design new educational facilities and apply new roofing to our existing structures. A building committee was elected and Zack Byrd, A. L. Ainsworth, C. H. Gerald, and others stepped in to serve. This new construction added 26,000 square feet of new educational space, an elevator, and many other ministry features for the church family. It was dedicated to the Glory of God in August of 2005 at a cost of near 4 million dollars. A Servant’s Courtyard was built to honor the work of the many women, men, girls and boys who had worked to make the project a reality. In October 2010 the Memorial Courtyard was dedicated to the Glory of God, honoring those faithful members throughout the century long history of the church who had died. We recently completed renovations to our children and preschool areas following the aftermath of Hurricane Rita which visited Southeast Texas during September 2005 and the subsequent arrival of Hurricanes Ike and Gustav in the ensuing years. Despite the storms, we continue to build our church family on a foundation of faith for the Glory of God. First Baptist Church, through the grace of our Lord, continues to grow in number and spirit. The people who make up the body of First Baptist Church realize that they are disciples with the presence of Christ - persons who have responded to God’s redemptive action and are committed to His task. Such are the people who have constituted the faithful, committed membership of this church. Reflecting back over the past 100 years fills us with a realization that God has truly blessed His church. Our future is bright because the physical and spiritual resources are present. The success of the future relies on each member doing his or her best. Surely, “Your eyes have seen what the Lord has done… ," Deuteronomy 4:3a (NASB). Our current pastor, Dr. Jason Martin came in view of a call June 25, 2017. Dr. Martin's first day in the pulpit was Sunday, August 6, 2017.